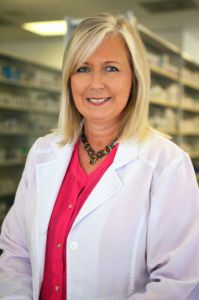 Cyndi Bowen graduated from the University of Mississippi School of Pharmacy in 1987. She began working in the pharmacy that would eventually become Family Pharmacy of Fulton in December of 1987, where she continued for 20 years. She temporarily left the store for ten years to serve as Director of Pharmacy for a long term care pharmacy. Missing “her people,” she returned to her starting point in 2016. Having now served multiple generations and watching children grow to return with their own families, she feels the customers in her store are her family and is extremely happy to be where she calls “home.” The pharmacy carries a broad range of medical services and houses a gift area as well. Cyndi is married to John Bowen who is employed at Itawamba Community College and is a sports photographer of the Ole Miss Rebels. Together, they have two children: Lindsey and Chase. Lindsey is a 2014 Ole Miss graduate, and Chase is a sophomore at ICC. Drop by anytime between 8am – 6pm and check out our gift shop for fun and unique items. Drive Thru available. We are located on 1313 S Adams St in Fulton, MS.